Rinse with hot water and wipe dry. Put back on stove top and reheat and ensure completely dried through. Wipe on a thin layer of flaxseed oil. Are the brown (rusty looking) areas quite normal? I'm certain it's not rust as I've taken a lot of care to prevent that, although if I smell closely it does have a slight rusty/metallic smell. 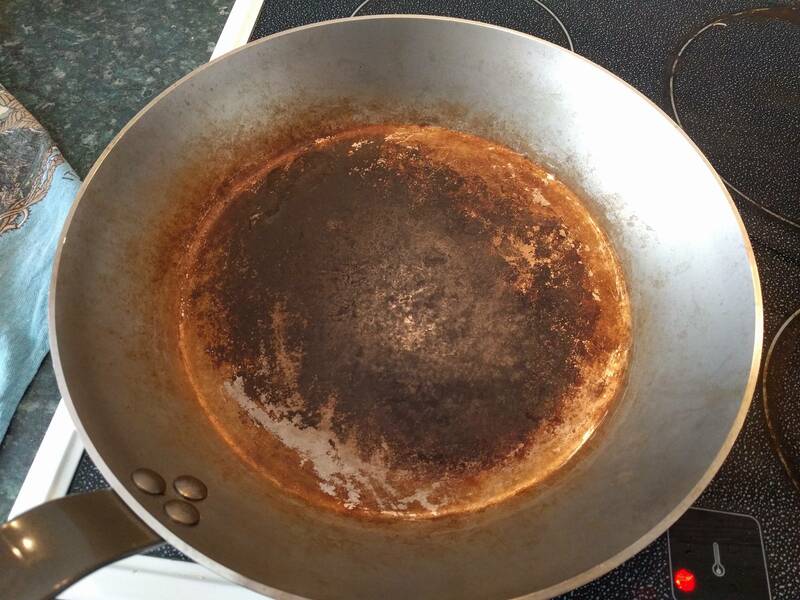 The only area of the pan that seems to develop some kind of patina is the center as you can see. How do I get that slick black finish over the entire pan? Will that just come from time & use or is my seasoning method incorrect? The patina seems quite flaky...is this normal? Thank you for any info/feedback provided. I have the same pan. Are you following the instructions that come with it? The center is too burned. The border is not seasoned. The border is not rusty. Is your fire big enough for the pan? Not the answer you're looking for? Browse other questions tagged seasoning-pans carbon-steel or ask your own question. How to maintain a smooth seasoning on carbon steel skillets?